Home > Earth's Oldest Rocks > Apex Chert Australia - Sold! Apex Chert Australia - Sold! 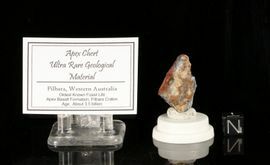 This is authentic Apex Chert from Pilbara, Western Australia, and is among the oldest specimens to contain the oldest known fossils on Earth. There is some controversy over Apex Chert - as so many other early life specimens among scientists, certainly not for all of them. Approximately 3.5 -4 GA, this rock was sediment on the floor of an ancient lake or ocean. Bacteria or algae lived on (and in) the sediment and were trapped and preserved. These fossil bacteria are so small that they can only be seen with a microscope. There have been approximately eleven taxa of prokaryotes found in the Apex Chert. Most are chains of single cells, forming filaments, very much like bacteria and blue-green algae do today found on the floors of modern lakes. These filaments of cells have the same shapes as some structures found in ALH 84001 (a meteorite found in Antarctica believed by some to contain actual life from Mars), which suggests that the structures in the meteorite could also be fossils of bacteria. This material was legally obtained in a trade with a major university. Collected from the William Schopf locality, in the late 1980's. Ships with display case, Certificate of Authenticity, tag and information about the importance of the specimen. -The Apex Chert (3.5-4.0 GA) of the Pilbara craton, Australia is known to have preserved eleven taxa of prokaryotes. - The Gunflint Chert of western Ontario (1.9 to 2.5 GA) preserves not only bacteria and cyanobacteria but also organisms believed to be ammonia-consuming and some that resemble green algae and fungus-like organisms (see specimen on website). 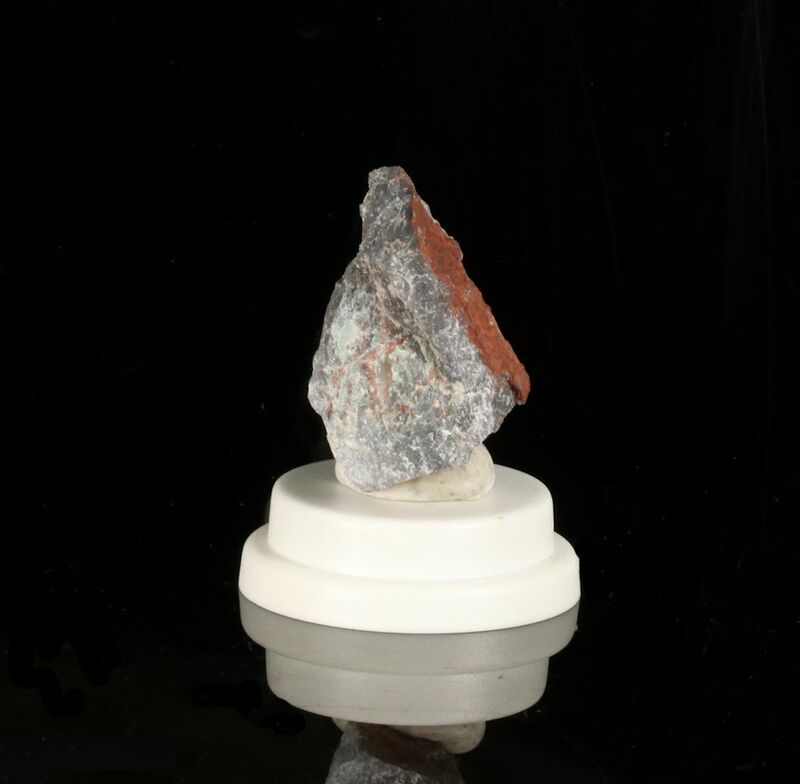 - The 3.3 - 3.5 GA chert of the Fig Tree Formation in the Barberton Mountains between Swaziland and South Africa, (see specimen on website). - The Devonian Rhynie chert (400 MYA) of Scotland has the oldest remains of land flora, and the preservation is so perfect that it allows cellular studies of the fossils (see specimen on website). Ships with display case, certificate of authenticity, and information containing the importance of the specimen. Stands and cube not included. LAST ONE.